i only used Win32pad - the "Notepad replacement"
Very old topic update: quick note that this is now the official forum topic for Win32pad (http://www.portablefreeware.com/?id=691), still at v1.5.10.4 (changelog at http://www.gena01.com/win32pad/changelog.shtml). 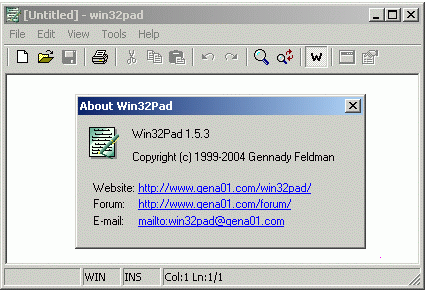 http://www.gena01.com/win32pad/ wrote: Win32Pad is a feature filled text editor that is written with a programmer in mind. Its main purpose is to provide enough functionality that is missing from notepad without sacrificing file size and performance. It's very fast and powerful. This editor is written so that you can install it and start using it. The features are added to make your experience better, easier and more efficient. http://www.portablefreeware.com/forums/ ... php?t=2838 <- Doublepost? @webfork: could you edit first post subject accordingly? Thanks in advance. Last edited by Midas on Fri Apr 07, 2017 7:03 pm, edited 1 time in total. Belatedly re-discovered this gem of a Notepad alternative, what a pleasure to use such a barebone but convenient tool ! Indeed, a long time favorite. The only thing I can think of that keeps it from being perfect is a character case changer. Like in "lower case" "UPPER CASE" "Capitalized Case" "aLtErNaTiNg cAsE" "Title Case" ...? and I wouldn't mind short-cuts for font effects such as "Boldface" "Italic" "Underline" " ̶S̶t̶r̶i̶k̶e̶T̶h̶r̶o̶u̶g̶h̶ ̶" either, would you ? ...oh, well, let's live with the devil we know, warts and all . I'd satisfy myself with UPPER and lowercase selection switcher, with associated shortcuts like Shift+Ctrl+U and Shift+Ctrl+L -- editor2 has them. While I recall seeing something sometime that used such resources only visually without affecting the underlying plain text file, that isn't common at all. What are the benefits of integrating an XP manifest to win32pad ? Do you mean you did replace the existing win32pad internal assembly manifest with one lifted from WinXP Notepad ? Those two examples (by that very fact) already fall into the word processor category. Regarding the manifest question, it's mostly a matter of aesthetics, making programs adapt to a more current look. Originally, Win32pad didn't have any manifest, as is the case with a lot of pre-XP born software. Adding the manifest (and changing the dialog font from "MS Sans Serif" to either "Tahoma" or "MS Shell Dlg" -- trust me, you don't want to get creative here...) will make it less blurry and add rounded corners to buttons and window frames. eminently suited, for instance, to drafting e-mail messages or forum posts. traditionally available in heavy-duty Word-processors, so much the better, but that does not change the ultimate destination of the beast. Should we perhaps, henceforth, pigeonhole Qjot and its ilk as Glorified Tex-Editors-Notepads instead ? re: Manifest - Thanks about your éclaircissement. Curiously, my Win32Pad v1.15.10.4 (link date 14-09-2007) comes complete with a buil-in PE manifest. Tools meant to work with plain text files without mangling them are conventionally called Text Editors and they are a dime a dozen at TPFC alone. Anything else is a Word Processor and, to accommodate formatting metadata, they resort to a number of different file formats, be it RTF, DOC, or ODF, just to name the most common. Their common feature is none of their files are human readable without them, as you can easily check by opening any of those files in a text editor. I vaguely remember some very old word processors that used ASCII control codes to denote text format, allowing their files to be readily opened by any text editor, but that doesn't change anything. The issue here, at least for me, is that addition of any extraneous formatting codes will immediately degrade the universal human readability of a plain text file -- i.e., in the absence of the specific tool(s) it was created with or for. I'm not factoring in required levels of literacy, either. As practical example, I have files dating back to the (mid) 90's in my computers (yep, I'm that old *sad grin*). Also you're probably right about Win32pad manifest, it's been some time since my bumbling about with it.